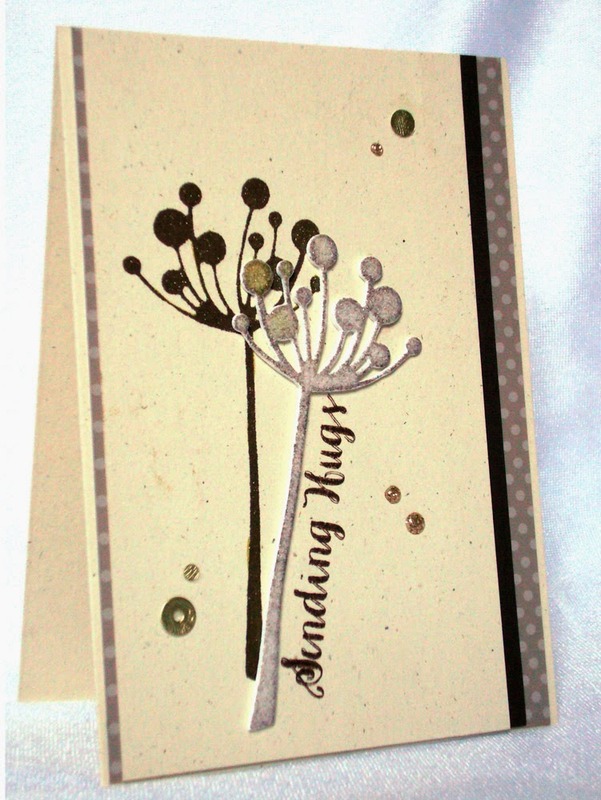 I managed to get one more card done for Day 2 of the CAS 4 course and this time, it was DIY stamps, by Shari Caroll. First I cut my Memory Box, 'Chloe Stem' die out of white fun foam and mounted it on to my acrylic block with temporary adhesive . . . which on fun foam, wasn't as nearly temporary as when it is on smooth cardstock! 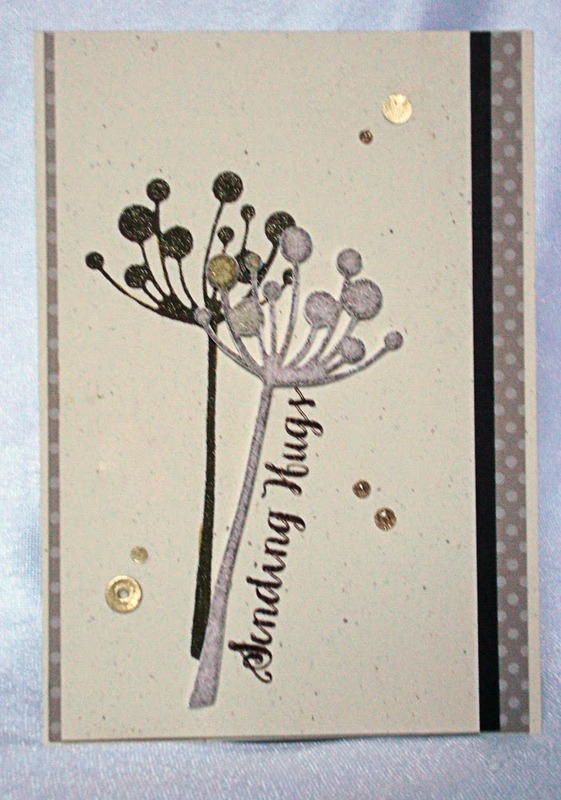 Then I coated it with Memento, 'Rich Cocoa' and stamped it on a panel of, Stampin' Up, 'Natural' cardstock. Next, I took the 'stamp' off the block and adhered it to my card layer and then stamped my greeting from the Simon Says Stamp, 'Friendship Sayings' and layered it on to a strip of chocolate brown cardstock and a panel of patterned paper. Finally, I mounted the finished panel on to a natural card base and added a few homemade sequins and glitter 'gems' (glitter glue). By now, I had nearly lost all light, so I only have the full cards, no detail shots, as the pictures were very poor. Love how this looks! Have to try this! Thanks for sharing! That is such a clever idea! Your "stamp" and the foam die cut turned out wonderful! love this idea - and your card is brilliant!! Very cool technique - with very impressive results! Love this! This is simply gorgeous Hazel. Your card is amazing and beautiful. especially the use of foamstamp. Beautiful card! Chloe stem is my all time fav die and your card is so elegant! Hazel, your card looks so elegant! Another beauty, Hazel!!!! Lovely elegant look and I really like how you've done the matting of the stamped panel!!!! The sentiment looks beautiful and I like the little bit of sparkle of the homemade sequins and the glitter glue!!! Sweet card and I love your amazing flower. What a sweet and kind way to send hugs.